Albert M Perkins was an Exeter, NH resident when he enlisted on 3 May 1861, originally for 3 months but later changed to 3 years, and was mustered in as a sergeant on 3 June with Co E, 2nd New Hampshire Infantry. He was promoted to 2nd Lt on 16 Aug 1861, to 1st Lt on 1 Sept 1862, and then to captain of Co K on 18 June 1863. He was wounded at Gettysburg on 2 July 1863, his shattered left arm requiring amputation. Transferred to Co D on 3 Aug 1863, he was mustered out on 21 June 1864. He was reappointed as captain of Co K a few days later, but he did not accept commission. He died in Exeter, NH on 6 Sept 1865, and was buried in the Exeter Cemetery. 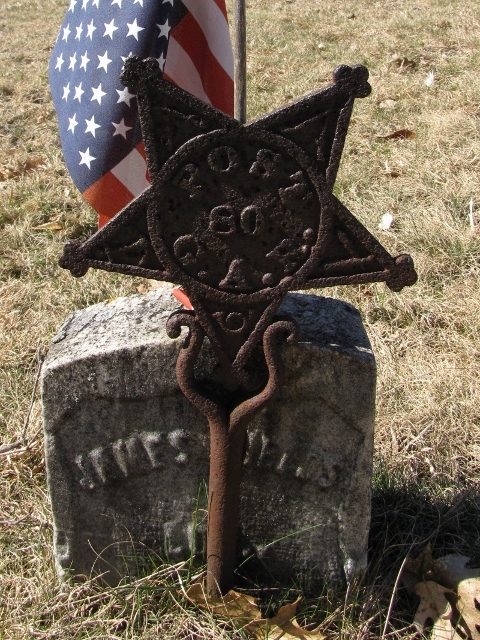 Perkins Post 80 grave marker (at right), decorating the grave of James Fields in Prospect Hill Cemetery, Epping, NH.